not get there with you” Dr. Martin Luther King, Jr., April 3, 1968. In 2011 the Shaw Festival joined forces with Toronto’s Obsidian Theatre to present Suzan-Lori Parks play Topdog/Underdog (2001). This season they team up again to present Katori Hall’s 2009 play The Mountaintop, a fictional account of the last night of Martin Luther King, Jr. Though Hall’s play won the 2010 Olivier Award for Best New Play, it is nowhere near as provocative or profound as Parks’s play. Its prime virtues are that it serves to memorialize a great civil rights leader and that it provides two meaty roles for black actors. In director Philip Akin’s hands that play receives a near ideal production, but that only serves to reveal its inherent weaknesses. Female African-American playwright Katori Hall (born 1981) sets the action of The Mountaintop entirely in room 306 of the Lorraine Motel in Memphis, Tennessee, on the stormy evening of April 3, 1968. That day King had delivered a speech known as “I’ve Been to the Mountaintop” to a rally in support of equal pay for equal work for black sanitation workers. The following day at 6:01pm he was shot dead outside his room by a pro-segregationist sniper. Hall imagines that King (Kevin Hanchard), in the midst of his “Poor People’s Campaign”, calls room service at the motel for coffee. 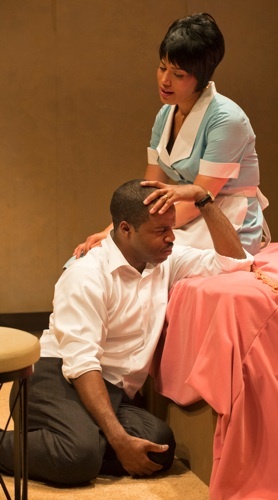 Carrie Mae, called “Camae” (Alana Hibbert), a maid on her first day at work, so entrances King with her vibrant personality that the play’s following 90 minutes represents their imagined conversation. The first half of the play is naturalistic with much of the humour deriving from Camae’s advice to King on what he ought to be doing to help black people. Thunder and lightening continues throughout their conversation, the thunder agitating King because it sounds like a bomb blast. After a particularly loud burst of thunder, King suddenly can’t breathe. As Camae calms him down the mode of the play shifts to fantasy and we discover that she is much more than merely a motel maid and that she has come to King on a mission of her own. King is not particularly enlightening. He smokes Pall Malls, drinks coffee, loves his wife and family, works too hard, cares too much. The one detail most will not know is that King’s given name was Michael, before his father changed it to Martin. This is the common flaw with plays about great people. An accumulation of personal details is never sufficient to explain their greatness. The best Hall’s play can do is to remind people of her generation and later of King’s importance, though how well constructing a dialogue with a fictional character will accomplish this is doubtful. Paradoxically, the play is most effective when King loses his specific identity and becomes an allegorical Everyman figure as in a medieval morality play. The premonition of death that comes through in his mountaintop speech finds him ready to make excuses for why he is not ready to die – he has so much left to do, his people need him, he wants to see his family again. In this King shares with Everyman a reluctance to leave this world even when he believes in an afterlife. If the play memorializes King, Hall also intends it to memorialize her own mother Carrie Mae Golden, whose greatest regret was not being able to attend King’s “Mountaintop” speech. Hall thus uses fiction to heal a family wound. In fact, one might wonder if the play would not be more effective if Hall made this point more explicit and put her mother as her mother on stage instead of disguising her as a motel maid. Kevin Hanchard, who created the role for the Canadian premiere of the play in Calgary earlier this year, gives a masterful performance. He shows us the frightened little boy in King as well as the prophet, the man of the senses as well as the spirit. He makes it perfectly believable that a man of great thoughts and suffering could also be a man who jokes and laughs. Alana Hibbert positively glows as Camae. She gives the character enough sass that we can believe it could overcome her awe to let her feel free to criticize the great man. Her most impressive moment is when Camae gives King an example of what he should be like and wearing his jacket and shoes delivers a powerful speech that does not end in reconciliation between whites and blacks. The Programme Note by Bob Hetherington states that the appeal of biographical plays “lies in the opportunity they afford an audience who admire historical characters to vicariously experience their presence”. This sounds like only a slight improvement over visiting a wax museum. Yet, even when we see a great man impersonated on stage, what exactly do we learn by seeing “Martin Luther King, Jr.” and a maid smoking and drinking together, or, even less believably, having a pillow fight? All those activities show is that the great man is just an ordinary person underneath. Given that the fantasy section of Hall’s play also shows that King is just an ordinary man, it becomes clear that Hall’s play focusses entirely on what makes King ordinary and captures virtually nothing about what him extraordinary. Hall’s fantasy section becomes so cartoonish and clichéd in conception, it is almost embarrassing to find someone like King placed in it. The vision of the future that Hall gives King, embodied in a projected montage by Andrew Smith of iconic photos from 1968 to the present, is technically exciting but intellectually bathetic in its mélange of historical events and American pop culture as if the two were equally important. Far better is the final speech Hall gives King, echoing the “Mountaintop” speech, that Hanchard deliver with passion and authority. The acting, direction and design of The Mountaintop are of such a high level that they only show us what an insubstantial play it is. One can not help but think that Hall’s play has received so much acclaim because of the great man who is its subject rather than because of the play itself. Photos: (from top) Alana Hibbert and Kevin Hanchard; Kevin Hanchard and Alana Hibbert. ©2014 David Cooper.